I have just finished reading the inaugural issue of Brave the Labyrinth, a new quarterly fanzine for Labyrinth Lords. Looking through my older posts I cannot find anything already written regarding Labyrinth Lords, so *spoiler*....that will probably be up next week. As a Frugal GM I have always been interested in both official magazines and fanzines that support FRPG games. While not all are high-caliber offerings, there are usually a lot of great ideas to be found that are a bit off the beaten path. 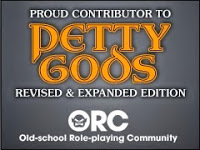 Even if you have players that seem to memorize every aspect of the core rulebooks, this "bonus" content is probably not on their radar. 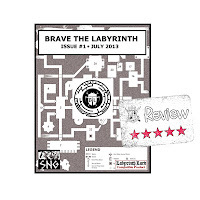 Brave the Labyrinth is a "pay-what-you-want" offering from Small Niche Games that is available in both download and print (print does have a set price) formats. With the notable exceptions this fanzine is black & white and notable without exception is the high quality/production value of this fanzine. It is a little light on art, but I really didn't notice this until I specifically went looking for the art to comment on this review. from my favorites. That being said, this fanzine is FULL of content I am going to be using in my own game. I really don't see much of anything I cannot use, unless I really want to stick to rules-as-written for the system I'm playing. I think that the content of Issue #1 is pretty close to drag-n-drop for anyone playing 1st Edition AD&D or one of the retro-clones. It would work well for HackMaster 4th Edition and with just some minor tweaks any other FRPG.